How much does OOTP cost? How much time does this league take up? It can take up hours or minutes depending on how involved you want to get. We export nightly during the season, advancing 7 in-game days at a time. 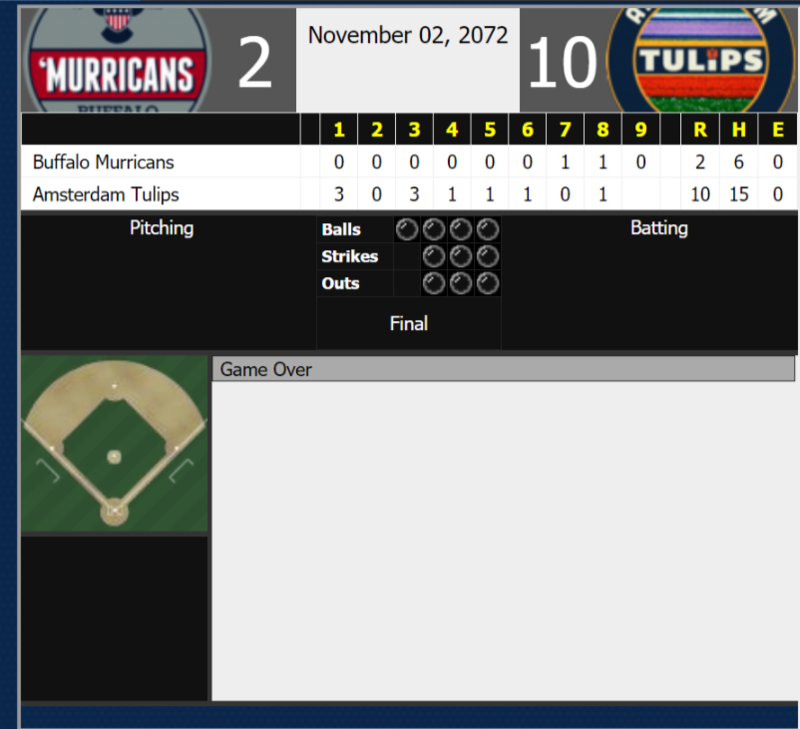 You can set it up where the CPU manager determines starting line-ups or you can set it to manual and tweak everything from your Single A squad to your UBL starting rotation. How do I select a team? The available teams are listed in the post below this one, with links to see their rosters as well as their financial information. So I’ve downloaded OOTP and picked my team, how do I set up the league? Here are the steps that you guys need to follow to get our league into OOTP. Once you finish that up you should be able to jump in and setup your team and lineups etc. I would also throw a password on your team so no one can screw around with it. Let us know if anything is screwy. How often does the UBL sim and how long is each sim? During the season commissioner bdub selig sims nightly, with 7 in-game days each sim. Where is the UBL online site where we vote for All Stars, Draft, and look for Sim results? This is the website, you will need to log in with your user name and the default password is baseball. How does the UBL draft? The draft is on the second Sunday in June. Once the draft pool is released during the season, a new UBL Draft thread will be opened and pinned. We will draft using the previous year's standings and draft as the season continues. We are hoping to implement a live draft soon where players can log on and select their pick. Is there a timeframe for each player to pick in? Yes, there is a 12 hour time limit in rounds 1-5. Once that is expired the utopian who has not picked will be given what the computer thinks is BPA. After round 5 it is a 4 our time limit. Q: Are there any rules about contracts? Also, the buyout for an option year must be at least 20% of the option year salary. If you forget to add a buyout, the year in question will be fully guaranteed. Don't stack player opt-outs and team options, you dummies. Pre-arbitration extensions must wait until the player has one year of service time and must be greater than or equal to the highest arbitration estimate. If a player has gone through an arbitration hearing, the salary of each future arbitration eligible year must be equal to or greater than the amount awarded to the player. I'll be updating this as owners come into the league. Here are the available teams, all linked. There is also the league homepage and a link to the financial status for every team. You will be able to move your team and/or select a new logo when you take over the team. Use this spreadsheet to see how many tickets you have to sell at different prices to meet your revenue quota. November 2, 2072 "The game that never was"